AMEN Corner: Declutter Your Life! Okay. I know that many of you will be shocked to hear that I am not a man who is madly in love with his socks. They bring no joy to my life. 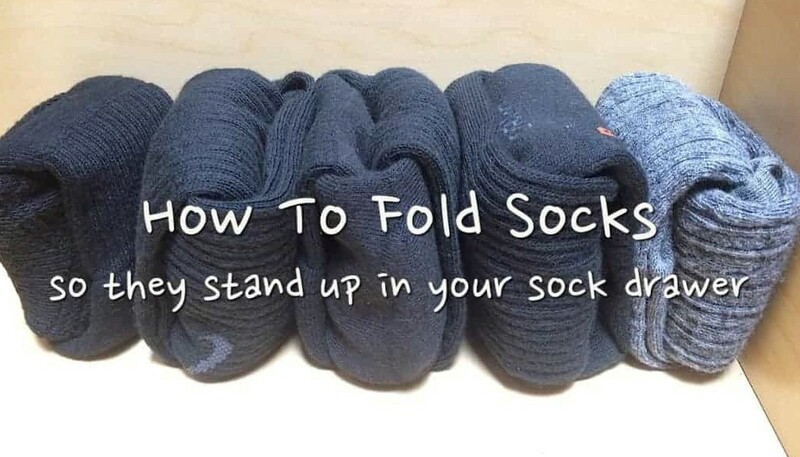 But I was recently reading about the wildly popular, organizing guru Marie Kondo and found that I should repent for the shameful way I treat my socks. I buy Costco’s industrial-sized packages of black socks for church and white socks for everything else. On one side of a dresser drawer, both black and white socks are jammed in and intermingled together because integrating both the sacred and secular socks is what I think Jesus would do. Marie Kondo highly disapproves. I learned that I am disrespecting my socks and when they are carelessly dumped in a pile, I cannot expect them to bring me the joy that I deserve to have when I gaze into my underwear drawer. I learned that I should match each sock with a partner and then lovingly fold them together into thirds. Carefully nestling them upright in a small box and then putting my special “sock box” in my drawer would allow my socks to breathe and rest and be happy once again after they have been worn on my feet. Of course, if Marie Kondo was as personally acquainted with my “size 13's” as I am, she would not recommend “rest” to my socks but a night at the neighborhood bar to knock back a few and try to drown out the horrors of being wrapped around my feet for over 24 hours. I learn that I must show my respect and appreciation for my socks and all my clothes, and when it comes time for them to be thrown out, I must first bow to and thank the apparel for the service they have given me. Kondo had been an assistant at a Shinto shrine so, once the item is thanked, she highly recommends a Japanese parting ceremony for the clothes and things I’m discarding that involves the burning of incense and a purification ritual that uses a sprinkling of salt. I prefer to toss the discarded item in the black bin and roll it out to the curb on Mondays. The decluttering evangelist preaches going through every item in your home and holding it in your hand to experience your feelings towards it. Marie Kondo says, “If you ‘love’ it, keep it.” If the item does not inspire great feelings of joy in your heart then you must discard it or give it to a thrift store. In doing so, you will find yourself soon surrounded by only those material things that you love and cherish. I don’t have strong feelings of love for material items but I love it when I’m sitting in my chair and my cat Cody climbs on me and curls up on my chest. He stretches his head up and presses the back of his neck against my nose so that he can feel my warm breath on his fur. Soon he is purring in time to my breathing and my cat is bonding with his human. I love it when I’m walking on the beach at Carpinteria and hand-in-hand with the blonde woman I’ll be spending the rest of my life with. I love brilliantly colored sunrises that display the majesty of God’s handiwork. I love my Bible with its leather cover now softened through many years of use. I love serving Holy Communion to those hungry and thirsty for the Presence of God in their life. According to Marie Kondo, those things that I love to have and love to do are all the things I should keep, and of course, I will. That scripture always comes to mind in the winter when I’m pruning my rosebushes. A carelessly maintained rosebush will become congested and unattractive. There are misplaced stems that are rubbing together or just growing in the wrong direction. They are healthy and growing but the plant is being shaped into something I don’t want it to look like and I need to determine which branches I want to thin out. I can choose the direction in which the rosebush will grow by what I prune out of it. This season of Lent is a good time to take a close look at our own lifestyle and habits and thin out what is taking your life in the wrong direction. Marie Kondo has an excellent method for decluttering the closets in your home to make space for the material things you love but the Holy Spirit will help you declutter your life and make space for more of the presence of God. Pray that He will reveal to you what those things are that are okay for you to do but are just not helpful for you. If we’ve carelessly maintained our life, priorities and leisure time, there may be things we do that are not spiritually helpful for us. Things that are not sinful but just not good for you. Use this time of Lent to declutter your life and discard all that which keeps you from growing in spiritual maturity and living in the presence of God. Amen?